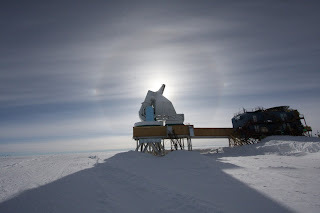 The primary reason I've been sent down here is to operate and maintain the new 10m radio telescope, built by the SPT (South Pole Telescope) collaboration, through the long antarctic winter. The 10m (so-called because it uses a 10m dish as it's primary mirror) is really a hell of a machine. My thesis work was on a 7m dish, so the size isn't really unfamiliar (particularly down here where there are no visual queues to tell size by), though the speed and power of this telescope are. When you get half a million pounds of steel swinging around overhead, it can be a bit intimidating. It was built during the 2006-2007 austral summer (Nov-Feb), and more or less continuously improved since then. This summer (again, austral: Nov 07 - Feb 08) has been spent fixing all the little problems that were discovered during the first year of use. I've somehow managed to show up at the perfect time, when everything's still new (still has that new-telescope smell), but after the major bugs have been worked out. Frankly, it's been a delight crawling around the telescope and working with it.